America is no longer a place where hard work is all it takes to succeed. Millions of Americans working full-time in good careers can't afford a safe, decent home for their family. The future of the American Dream is at stake. Home1, a new movement shining a spotlight on the nation's housing crisis, launched last week in a room filled with leaders from the development and housing community, including New York City Housing Commissioner Maria Torres-Springer. The Home1 launch event and related movement is working to motivate and inspire politicians, the media and the general public to address one of the most serious and least talked about problems in America: the escalating shortage of homes that average American families can afford. The campaign is built around a new website, http://www.home.one, and includes a collection of videos, such as The Whole Story, a 3-minute animated video, which lays out a series of startling facts about the crisis and what it is doing to the nation. 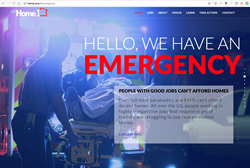 The campaign website lists essential workers, such as full-time paramedics, teachers, medical secretaries and bank tellers, who can no longer afford a decent one-bedroom home in the United States. Rising rents have pushed many Americans into a precarious balance where one injury, unexpected expense or late paycheck is enough to tip them into a cycle of homelessness. 2.9 million people per year are kicked out of their homes because they can’t afford their rent; that’s one family every 11 seconds. The Home1 launch was held in the Lower East Side of Manhattan, inside Essex Crossing, one of the city’s newest mixed-income communities. At the event, housing developers and activists spoke out about the crisis and shared their experiences and solutions for addressing it. Home1 was created by Public Interest, a cause-driven marketing firm and media company that helps nonprofits deliver their message in a way that breaks through to their audience. At last week's event, Public Interest CEO Michael Franzini showed this 7-minute preview of a feature-length documentary they are producing on the crisis, to be released later this year. Home1 is a nonpartisan movement built on the idea that, in America, hard work is all it takes to build a secure life for your family. Our mission is to ensure that every hardworking American has a decent home. To get there, we will shine the brightest possible light on the crisis to help people understand the magnitude of the problem and the serious threat it poses to America's future. We are putting this issue on the map, so that every politician in local, state and federal government will talk about it and work to address the crisis. To join the movement and learn more, visit http://www.home.one.